The Command Drive Recorders™ range comes to you after extensive research, development and testing from a sea of possibilties. Selected for their build quality, image quality, mounting options, price and useability. With 8GB micro SD card included as a bonus, you can offer the consumer a product that is complete and ready for use. In high quality and informative retail packaging. 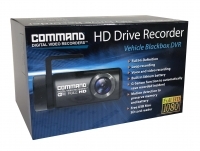 The NEW Command Full HD Drive Recorder is designed to offer all of the features our customer want in a sleek stealth design. DVR functions can be accessed via out new WiFi connection on your smart device. 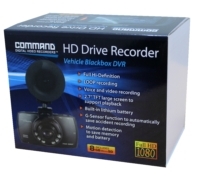 These functions include record monitoring, playback, file download and setting adjustments. Much like our other DVR solutions this unit comes as a complete kit including 12-24v power adaptor, USB cable for direct PC connection, USB Micro SD card reader, 8GB Micro SD card as well as a complete instruction manual. up to 32GB SD card capacity or 5 hours recording.